A man was killed and a woman was seriously hurt in a hit-and-run crash in Williamsburg this morning. Police told the Times that two pedestrians were crossing Borinquen Place near Keap Street at approximately 5 a.m. when they were hit by the driver of a Chevy Malibu, headed east. The two were thrown into the westbound lane and were struck by a second driver. Raoul De La Cruz, 35, died at the scene. The woman, 24, was taken to Elmhurst Hospital in serious condition. 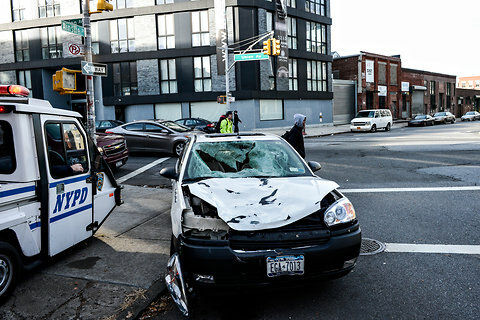 The Malibu, with a gaping hole in the windshield and its make barely discernible from front end damage, was found abandoned at Union Avenue and Ainslie Street, five blocks away, the Times reported. Police have not yet released the name of the owner. The second driver, who remained at the scene, was not charged. De La Cruz, the father of two young girls, worked as a parking lot attendant in Manhattan, according to the Times. At the scene of the crash, a friend of Mr. De La Cruz, Maria Batista, said the emergency vehicles gave her a sickening sense of déjà vu: her brother-in-law had ben killed by a speeding driver in the exact same spot in January. “It’s horrible, and it keeps happening,” said Ms. Batista, adding that she had asked city officials to provide better traffic safety for the block, which is near ramps for the Williamsburg Bridge and the Brooklyn-Queens Expressway. In January, 57-year-old Lepoldo Hernandez was struck and killed by two drivers, one eastbound and one westbound, as he crossed Borinquen Place near Keap Street. In September 2011, cyclist Nicolas Djandji was killed by a motorist at Borinquen and Rodney Street, about a block away. This fatal crash occurred in the 90th Precinct, where in 2011 officers issued 6,192 citations to drinking pedestrians and 13 tickets to speeding motorists. Other recent victims of deadly drivers in the 90th Precinct include cyclists Terence Connor and Mathieu Lefevre. To voice your concerns about neighborhood traffic safety directly to Deputy Inspector Mark DiPaolo, the commanding officer, go to the next precinct community council meeting. The 90th Precinct community council meets on the second Wednesday of each month at 30 Montrose Avenue, Community Room, at 7:30 p.m. Call 718-963-5309 for information. The City Council district where Raoul De La Cruz was killed is represented by Diana Reyna. To encourage Reyna to take action to improve street safety in her district and citywide, contact her at 212-788-7095 or 718-963-3141. Update 11/16: Adam Recio, 27, of Brooklyn, was arrested yesterday and charged with leaving the scene and driving without a license. It is not yet known if additional charges will be filed, according to a spokesperson with the office of Brooklyn District Attorney Charles Hynes. Time and again we see the negative law and order repercussions of using 19th century technology (e.g., car activated & allowed to run based on a metal key) while we live in a 21st century world, with cars having tens or hundreds of times the computing power used to put a man on the moon. Activation/operation of a car should require credentialing of a person through irrefutable means. Easy ways to accomplish this include having a PKI smart chip on licenses/cars equipped with card reader and pin pad. Maybe cars should take a picture of the driver every 10 seconds or so while driving. Easy peasy technology. Maybe have a fingerprint pad next to the ignition key slot (or “start” button). I realize there are thousands of things we need to do to make streets safer. One of those thousands should be “make it harder for killers to flee the scene & never be caught”. Oh, also, such a license based credentialing would virtually eliminate car theft, and prevent people from driving on a suspended license (since their chip would be deactivated/confiscated). That said, it would take a generation to phase this in to all cars on the road. I ride my bike through there every day to and from the bridge. It’s freaking scary. Everybody drives way past speed limit to make the last few lights before the bridge and end up speeding through reds. That area needs 20mph speed limit and some serious enforcement.